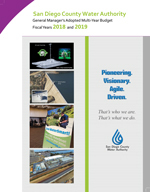 The Water Authority’s Adopted Multi-Year Budget for Fiscal Years 2018 and 2019 incorporates both our operating and capital budgets into a single volume. The budget is organized around the Water Authority’s Five-Year Business Plan programs of water supply, water facilities, and business services. The Water Authority’s Adopted Multi-Year Budget for Fiscal Years 2016 and 2017 incorporates both our operating and capital budgets into a single volume. The budget is organized around the Water Authority’s Five-Year Business Plan programs of supply, facilities, and core business.